The project at Ahlstrom-Munksjö's Jacarei mill is expected to be completed in the third quarter of 2019 and will expand the plant's capabilities of coating and calendering on the paper machine. Aug. 30, 2018 - Ahlstrom-Munksjö will invest EUR 21 million in its Coated Specialties business to improve capabilities and flexibility at its Jacarei plant in Brazil and better serve customers in South America with a broader offering. The project is expected to be completed in the third quarter of 2019 and will expand the site's capabilities of coating and calendering on the paper machine. It will allow Ahlstrom-Munksjö to offer more efficient, high-quality on-line coated products to its customer in the areas of self-adhesive and wet glue labeling, flexible packaging and sublimation printing. Demand growth for high value-added coated specialty papers has been robust in the region during past years. The upgrade of the production line will also improve the company's flexibility to deliver a wider range of product trims, better matching the needs of its customers. Additionally, it will open up further innovation opportunities in existing and new product areas. The benefit of the investment includes an improved product mix and increased production efficiency. 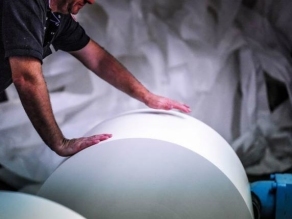 In April, Ahlstrom-Munksjö agreed to acquire MD Papéis' Caieiras specialty paper mill, located in the vicinity of Jacareì, in the Sao Paulo area. Following the acquisition, Ahlstrom-Munksjö's presence in Brazil includes three operating plants, all near Sao Paolo, employing over 700 persons and with revenues of approximately of EUR 200 million.